What if leaders could be sued for malpractice? Malpractice, as a legal course of action, is usually applied to professionals in the healthcare, legal, accounting, or financial investment fields, but imagine if it applied to bad leaders? Would it change the way you view your position of authority and influence you to be a better leader? The sad reality is there are too many leaders in organizations today guilty of malpractice. I believe that bad leadership accounts for the majority of dysfunctional behavior in organizations and our research has shown it can result in a financial cost equal to 7% of a company’s annual revenue. That’s over $1 million dollars for an organization with $15 million or more in annual sales. 1. You’re not trusted – Trust is the one non-negotiable for successful leadership. If you have it, all things are possible. If you don’t, you might skate by for a while as people comply with your leadership, but you won’t gain cooperation and collaboration which are key to long-term success. Lack of trust in your leadership shows up in many ways: people avoid you, they don’t confide in you, gossip, low morale, and lack of engagement just to name a few. 2. Being self-oriented, not other-oriented – Examine the way you speak. Is your language filled with “I/me/mine” or “you/we/our?” Do you place your success ahead of your team’s? Is your leadership in service to self or in service to others? 3. Focusing on results at the expense of relationships – Good leadership focuses on both results and relationships. Focusing on either one to the detriment of the other will place the organization out of balance. You could focus solely on results and burn your people out in the process, or you could cater to the whims of your people and party all the way to bankruptcy. As stewards of the organization, leaders have to strike the right balance between the needs of their people and the bottom-line. 4. Being unethical – I’ve yet to meet anyone who would describe himself as unethical, yet the fact is too many leaders have grown comfortable with practicing situational ethics. We’ve grown comfortable with rationalizing our choices or bending the rules ever so slightly to achieve our goals. Dishonesty, taking credit for other people’s work, turning a blind eye to wrong doing, or dismissing bad behavior as routine are ways this shows up in the workplace. Faced with an ethical dilemma? Here’s three questions that could save your career. 5. Not caring about people – Believe or not, there are many people in leadership positions who don’t really like people. These leaders have moved into management positions because it’s the next natural career step or it’s the only way to gain experience or make more money. You hear them say things like “I wish my people would leave me alone so I can get my job done!” Uh, hello…your people ARE you’re job! Caring for people means you value them for who they are as individuals, not just as workers paid to do a job. 6. Holding people back – Have you ever seen or experienced a situation where a star performer was held back from promotion in order to suit the needs of the boss? I have and it’s not pretty. It’s downright despicable on the part of the leader. Leaders should take pride in being a net-exporter of talent, someone who attracts top talent, grows them to new heights, and helps them move to new opportunities (hopefully ones you’ve created for them in your own organization). 7. Carelessness – Just like a surgeon being careless and leaving a sponge inside a patient, leaders often move too fast and don’t practice good listening skills, use the wrong leadership style, give ineffective feedback, or are preoccupied and not truly present when meeting with an employee. All these behaviors diminish the power and potential of your people. 8. Acting like a know-it-all – Malpractice involves inflicting some sort of injury or harm to another person and know-it-all leaders harm their employees by making them feel “less than.” The boss’ way is the only right way, no matter what the facts are or what others say. A colleague of mine experienced this attitude with a doctor who was treating her young daughter. The girl experienced a seizure and was exhibiting all the signs of diabetes insipidus, a condition that ran in the family. Yet every time my colleague suggested it as a cause, the doctor talked to her like she was an idiot and ignored the test results that confirmed diabetes was indeed the cause. Please don’t be a know-it-all, unless of course you want to be a jerk. 9. Not using all the resources at your disposal – Wouldn’t you want your doctor or lawyer to examine all possible avenues in their attempt to help you? Your employees want the same thing. They want you to use your power to remove roadblocks, secure resources, and provide them the tools and training they need to succeed in their jobs. It’s malpractice when leaders get lazy and don’t go to bat for their employees because it’s too exhausting, hard, or inconvenient. 10. Not staying current and relevant – Leaders need to stay educated and current in their chosen fields, both technically and as leaders. You can’t rely on old practices and outdated leadership techniques (e.g., command and control leadership and carrot-stick motivational techniques) that may have been applicable 30 years ago but aren’t relevant in today’s global, fast-paced, inter-connected work environment. 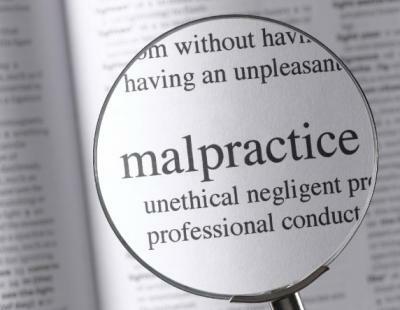 Malpractice, in the general sense of the word, is negligent conduct by a person in a position of trust that causes harm to another individual. Leaders are in a position of trust and we should use our influence for the betterment of our team members, not for their harm. Randy Conley is the Trust Practice Leader at The Ken Blanchard Companies and his LeaderChat posts appear the fourth Thursday of every month. For more insights on trust and leadership, visit Randy at his Leading with Trust blog or follow him on Twitter @RandyConley. Reblogged this on Willow Creek Ministries SA. Awesome Article: I am going to include this in every class I teach……….now if only we get Congress to sign up for this. I particularly like the three questions. Thank you for sharing this. Ron, thanks for sharing. This is an eye-opener for many leaders. Shared via every front. Great article just the same. Thanks for adding your thoughts Rod. You are absolutely right about the proper legal use of the word which is why I think it’s so interesting to ponder what it would be like if leaders could be liable for malpractice. I’m thankful we’re not! Good article and brings forward key leadership issues. I hesitate a little at the use of malpractice given how ‘loaded’ that word has become – but the content of the article and intent is spot on! I really liked the ‘situational ethics’ comment! If educational leadership needs to evolve with society and adjust their vision to include 21st Century skills (collaboration, data synthesis, problem solving, etc. ), is failure to change sufficient to charge leadership with Malpractice? I am not sure, but negligence, certainly. By failing to move forward, 8 of the10 warning signs are present (all but #3 and #4 which are still present to a lesser degree). Great article, thank you for the read. Great points Eric! I can see how “failure to adapt to change” could be leadership malpractice. Ideally, leaders are the ones that have their eyes on the future and help the organization evolve to what it needs to be, rather than keeping in stuck in the old ways of doing business. Thanks for adding your insights to the discussion! Excellent points made, Randy. I’d love to see a follow-up article, especially given your connection w/ Kenneth Blanchard, on all of the POSITIVE attributes or signs of great leadership…this will offer something for leaders to strive towards. Thank you! Hi Rossina! Thanks for your comments. Be on the lookout for more articles about the positive side of leadership!